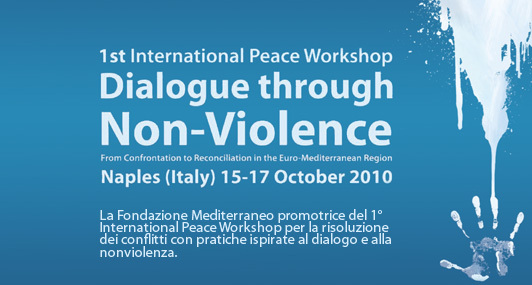 The Fondazione Mediterraneo with the Maison de la Paix - Casa Universale delle Culture held in Naples the first edition of the International Peace Workshops entitled ‘Supporting dialogue through non-violence. From clash to reconciliation in the Euro-Mediterranean Region´. Michele Capasso, President of the Fondazione Mediterraneo illustrated aims and contents. Guest Speakers: Gianluca Solera (Anna Lindh Foundation), Paolo Beni (Arci), Flavio Lotti (Local Communities for Peace), Miralem Tursinovic´, Bosniak, ex combatant from Ngo Youth Resource Centre of Tuzla; Nouraldin Shehada, Palestinian, from Combatants for Peace; Gerard Foster, Northern Ireland, Catholic, from Teach Na Failte; Itamar Feigenbaum, Israeli, from Combatants for Peace and others, who confirmed the importance of this seminar where ex combatants met for the first time to speak and construct peace. The workshop falls within the framework of the activities promoted by the Maison de la Paix – Casa Universale delle Culture of Fondazione Mediterraneo, in order to prepare the Universal Forum of Cultures to be held in Naples in 2013. The three days of seminars, held in Naples from 15th though 17th October, are promoted by the Fondazione Mediterraneo as well as by Anna Lindh Euro-Mediterranean Foundation for the Dialogue between cultures and by Arci, in association with the movement Combatants for Peace and with the National Coordination of Local Communities for Peace and Human Rights. These Seminars are held under the High Patronage of the President of the Republic and with the sponsorship of the Regione Campania and the Province of Naples. The aim is to deepen the reflection on the role that practices based on dialogue and non-violence can play for conflict resolution, both in case of armed conflicts and in case of social, ethnic or political conflicts where violence is raging. Particular interest was raised by the report and sharing of experiences, contexts and testimonies made by sixteen ex combatants and non-violent activists from Israel and Palestine, from Balkans, Northern Ireland, Great Britain, Cyprus and Turkey, as well as by the Italian organizations working in areas of crisis. The idea of the seminar came from the cooperation between Fondazione Mediterraneo, Anna Lindh Foundation and Combatants for Peace, a movement of ex Israeli and Palestinian soldiers who, due to their commitment, have received the Euro-Med Award for Dialogue 2009, section of the Mediterranean Award created in 1996 by the Fondazione Mediterraneo. The aim of the seminar is to create a network in Europe and in the Mediterranean for mutual support and exchange between social organizations and ex-combatants for reconciliation, non-violent conflict resolution and justice.